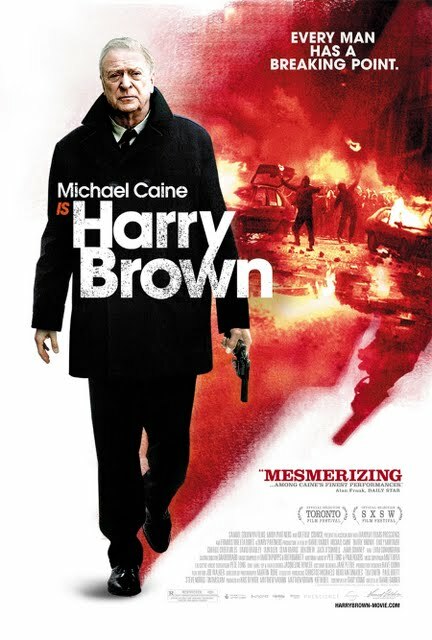 As a marine stationed in Northern Ireland, Harry Brown (Michael Caine) was trained not only to kill but to watch his own fellow soldiers die if the medics were stationed too far away. Yet as a civilian following his military service, Harry put all his training on the back burner for the extent of his long, happy marriage to his beloved Kath who passes away shortly into Daniel Barber's gritty character-driven crime drama. Even though Harry has left his own violence behind, society hasn't followed suit as the East London tenement style housing estates in his neighborhood has turned into a far more dangerous war zone than he faced in Ireland wherein young mothers, elderly men, and children are gunned down by remorseless juvenile thugs. But the thing about training or killing (to be more precise) is that once one has already flipped that switch before, it's easy to do so once again... just like riding a vengeance fueled bike to mix the metaphor even more. And this is precisely what happens after Harry's best friend Leonard is found savagely murdered by the surrounding young gang who'd been terrorizing him on an escalating basis. To anyone else and certainly to Detective Inspector Frampton (Emily Mortimer) and her sergeant partner Hicock (Charlie Creed-Miles), Harry Brown seems like an assuming, mild-mannered, tea-drinking, chess playing pensioner who's utterly heartbroken to discover that the only person he'd had left in the world had been killed in such an unspeakable manner. This belief is further cemented when Frampton follows up with Brown to share the tragic news that because his friend had been carrying a military issued knife inherited from his father that the boys who took his life would most likely only get manslaughter if the case went to trial, Trying to console the former marine in any way possible, Frampton weakly suggests that since his chess partner is gone that perhaps Brown could possibly get a computer game as a replacement. But once again the thing about a computer is it can never be a friend nor serve as a substitute for someone who was nearly a surrogate family member. So deftly falling back into his old habits as a soldier, Brown decides to go hunting for the killers with a bag filled with hot guns as his new partner, picking the pawns off the street one at a time until he can lure the mastermind out of the shadows for checkmate. 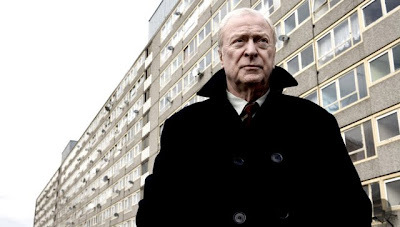 Harry Brown is less heavy handed and awkward than the politically pointed yet thematically similar Gran Torino but still manages to touch on social issues with its character fueled action approach that admirably doesn't celebrate or relish in the vigilante aspect a la The Brave One, Law Abiding Citizen or Death Sentence. Nonetheless it's unrelentingly grim right down to disgustingly authentic Gone Baby Gone style dialogue to reflect the real sounds of the increasingly violent urban mean streets. Thus, it goes without saying that fans of the typically charming Mortimer will be surprised to find the Lovely and Amazing actress in something this bleak. 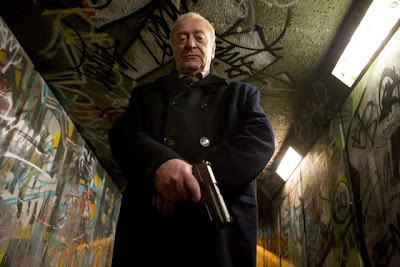 However, Michael Caine is particularly compelling as a British cross between Clint Eastwood and Charles Bronson in a welcome return for the traditionally posh gent to crime sagas of the actor's past (Get Carter, The Italian Job, Mona Lisa), considering a role that actually hits him right where he lives... literally as it's filmed in the neighborhood where he grew up and also ties in the man's past as a was veteran. Despite this, the obvious and admitted “urban western” execution to which Barber reveals he paid homage in the movie's production notes doesn't always translate well as the movie moves from an excruciatingly tense Taxi Driver inspired turning point sequence for Brown to a slightly too pat “wild wild west old saloon” like final standoff set in a pub. Fortunately, the work proves to be quite a nail biter particularly in an eerie trap that Brown sets by baiting two perpetrators to come out of a tunnel by literally keeping one of their mates on a leash, which is sure to make you shudder the next time you think of typecasting Caine in another Pygmalion like Educating Rita or Cider House Rules role. As Caine reminds you throughout the film, a pensioner can still play one hell of a Dirty Rotten Scoundrel if he's pushed far enough.